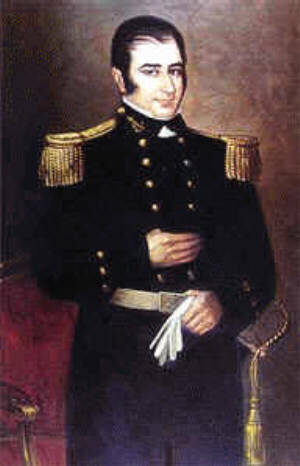 In the War of the Pacific, which lasted from 1879 to 1884, Chile acquired about a third of its current territory, in the northerly Atacama Desert, from Peru and Bolivia. That marks the last time that Bolivia enjoyed direct access to the ocean but, with the cooperation of Peruvian president Alán García, the landlocked country will soon do so again - Peru has granted a strip of coastal access about 200 kilometers (roughly 120 miles) north of the Chilean border for Bolivia to do as it pleases - including establishing a naval presence there. At present, Bolivia’s navy is confined to Lake Titicaca (shared between Peru and Bolivia), and the eastward-draining rivers of the Amazon Basin. The rights and wrongs of the war aside - and it’s easy to argue that the nitrate-rich Atacama would have contributed to prosperity for both Peru and Bolivia as it did to Chile - it’s questionable whether this “outlet to the sea” for which Bolivia has clamored for more than a century will revive anything other than Bolivian nationalism. 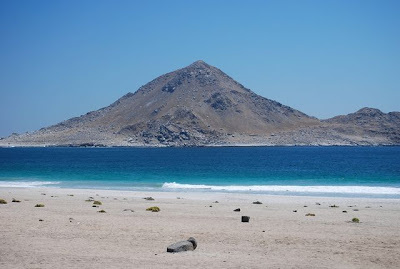 In reality, for more than two decades since a paved road from the Chilean port of Arica (pictured above, it was part of Peru in the 19th century) reached the Bolivian border, Bolivia’s access to the sea is better than it ever was - for commercial ends at least. 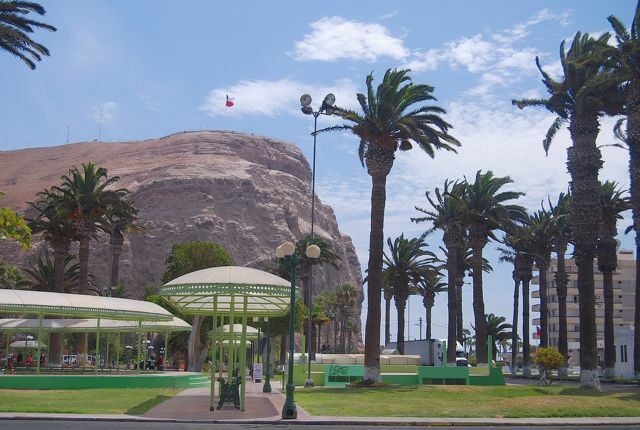 By far the closest and quickest route from the Andean highlands to the Pacific, Arica is also the place where Bolivians take their beach holidays. In the 19th century, when Bolivia’s main port was the now crumbling ghost town of Cobija (pictured above, Cobija served as a location for the recent James Bond flick Quantum of Solace), it exported silver from the bonanza mine at Potosí, though Antofagasta eventually succeeded it. Today, though, it probably means that Bolivia will build a Pacific fleet that it doesn’t need, and can’t afford, in peacetime - primarily because of a long-lived irredentist grudge against Chile. Across the Andes, meanwhile, Argentina is experiencing a sea change of its own with the fatal heart attack of former president Néstor Kirchner on Wednesday morning in the tourist center of El Calafate - a town which the Santa Cruz province native helped put on the map with massive infusions of capital that helped build an international quality airport for the gateway to the Moreno Glacier (pictured above). 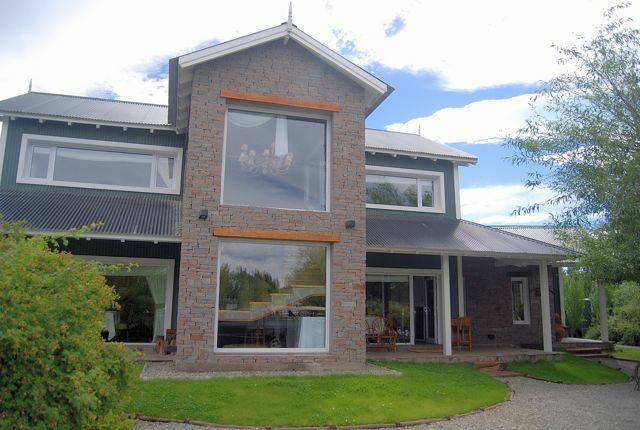 With his widow, the current president Cristina Fernández, he also built the town’s sprawling Casa Los Sauces luxury hotel complex (pictured below), where accommodations go for around US$700 per night. The Kirchners maintain their own house on a contiguous property. Kirchner, who served as president from 2003 to 2007 before being succeeded by Fernández, was by most accounts a notorious Type A personality who had had several other health scares in recent months. Widely considered the leading candidate to return to the presidency next year, he leaves a political vacuum despite the immediate outpouring of support for his widow from along the entire political spectrum. Soon enough, Argentines will learn whether Fernández can survive, politically, without the man that many of them considered her co-president, even as he held no formal executive power. Like the Wild West of the United States, Patagonia was a frontier region and, as such, it was often a lawless place where might made right - and, as often as not, that might came out of the barrel of a pistol or a rifle. 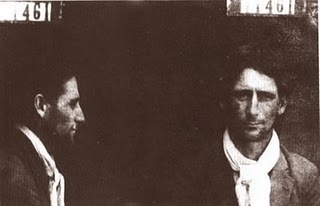 Like the West, it spawned legends such as the Robin Hood figure Juan Bautista Bairoletto (pictured below in a mugshot) and the rebel ranchhand José Font (also known as Facón Grande, or “Big Knife,” he was a key character in director Héctor Olivera’s film La Patagonia Rebelde). In fact, the Argentine folk-rock singer León Gieco recorded an album, Bandidos Rurales, whose title song gave the same treatment to Bairoletto and others that Bob Dylan did to John Wesley Harding. In fact, several Old West figures, such as the self-styled sheriff and tall-tale teller Martin Sheffield of Texas, even made their presence known in southernmost South America (Bruce Chatwin recounted Sheffield’s tale in his classic travelogue In Patagonia). Sheffield’s was not the only yanqui presence in Patagonia, though - in the early 1900s, Robert Leroy Parker and Harry Longabaugh fled the United States to homestead near Cholila, a hamlet in southern Chubut province, where US author Anne Meadows tracked down their homestead more than a decade ago. 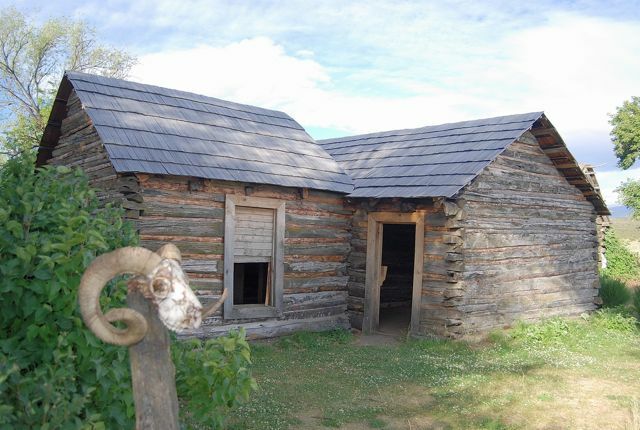 Better known as Butch Cassidy and the Sundance Kid, Parker and Longabaugh didn’t last long at Cholila, but they did build a distinctive cabin that survives today. The province of Chubut acquired the then crumbling cabin (pictured above), long occupied by the aging gaucho Aladín Sepúlveda (who died in 1999), and has since restored it without turning it into a theme park attraction - at least, there are no cardboard cutouts of Paul Newman and Robert Redford standing outside or peeking through the windows. Meadows detailed her findings and much more in a book, Digging Up Butch and Sundance, that has gone through several editions since its initial publication in 1994. 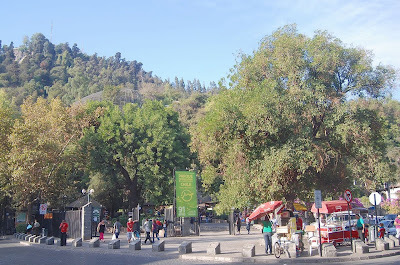 More than anything else, their book has been probably responsible for bringing gringos to Cholila, even if many only catch a glimpse of the cabin from the left side of the bus that goes from the city of Esquel through Parque Nacional Los Alerces to the town of Lago Puelo. Butch and Sundance, though, may not have been the most interesting outlaw in Patagonia - that title might well fall to an unsung Englishwoman, their contemporary Elena Greenhill, whose story may hit the big screen some time in the future. According to the Buenos Aires daily La Nación, Olivera would like to bring journalist Francisco Juárez’s account of Greenhill’s life to the cinema. And there’s a colorful story to tell. 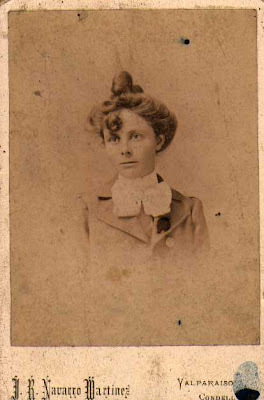 Born in Bath, Ellen Greenhill arrived in Chile in 1888, at the age of 13. Six years later, she married a rustler twenty years her senior who died, mysteriously, in the backcountry - amid tales of marital discord and spousal abuse. Continuing her husband’s activities, she became known as la bandolera inglesa (the English bandit) and, though she apparently never killed anybody herself, she once kidnapped two Chubut policemen and humiliated them by forcing them to do household chores. That challenge to their machismo, apparently, inspired the police to seek revenge. At the locality of El Chacay, on the Patagonian steppe midway between Esquel and the coastal city of Puerto Madryn, they set an ambush at which Greenhill died in 1914. This week, I wind up my tour promoting Moon Handbooks Argentina with two events in Chicago: Tuesday evening with a 6 p.m. dinner meeting at the Adventurers Club, under the auspices of the Geographic Society of Chicago, and Wednesday afternoon at the Chicago Cultural Center, also with the sponsorship of the Geographic Society, at 3:15 p.m. According to the Buenos Aires daily Clarín, the city airport Aeroparque Jorge Newbery will soon be closing for repairs for nearly a month, from early November until December. In that period, all domestic flights as well as the usual international flights will operate out of Aeropuerto Internacional Ministro Pistarini (pictured here), popularly known as "Ezeiza" after the suburb in which it is located. 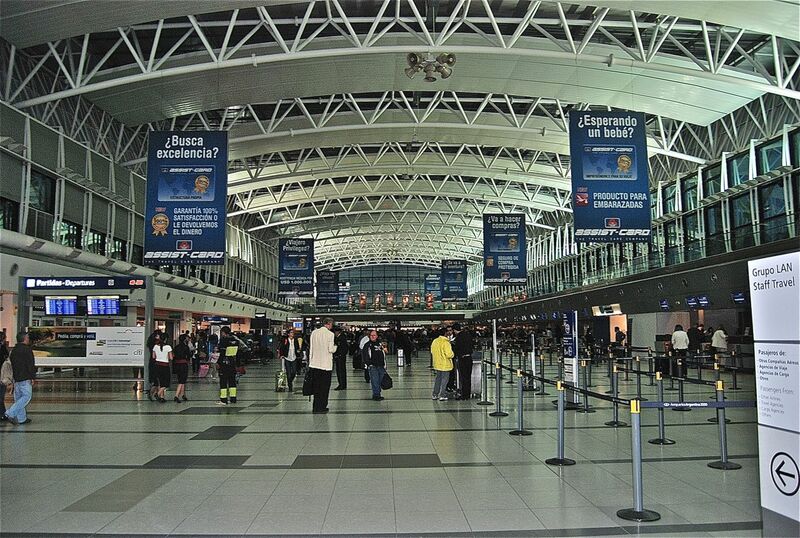 In some ways, this will be more convenient for foreign travelers making immediate connections for destinations elsewhere in the country, who will not have to undertake the cross-town trek to Aeroparque - rather, they will just be able to wait for their connecting flight. On the other hand, for those spending at least a night in Buenos Aires, it will be notably less convenient and more expensive - instead of catching a cheap taxi to close-in Aeroparque, they will have to take a more expensive taxi/remise or a shuttle service, such as Manuel Tienda León. This will also require leaving earlier than otherwise, as the taxi or shuttle, in turn, will have to navigate heavy freeway traffic, especially if the departure time is anywhere near rush hour. In another sense, arriving at Ezeiza could be even more expensive, at least for some nationalities. At the end of last year, Argentina instituted a so-called tasa de reciprocidad (“reciprocity fee”) for nationals of countries, such as the United States (US$140), Canada (US$70), and Australia (US$100), that require similar fees from Argentine visa applicants (Argentina does not, however, require US citizens, Canadians and Australians to obtain advance visas). The hitch here is that the “reciprocity fee” is, at present, collected only at Ezeiza and not at Aeroparque. 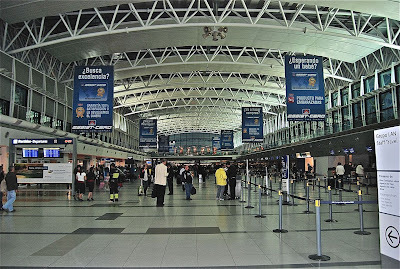 While all intercontinental flights land at Ezeiza, many regional flights from Brazil, Chile and Uruguay normally land at Aeroparque, where nationals of the countries in question are not required to pay the fee. If flying from, say, Santiago de Chile, passengers with “qualifying” passports should be ready to fork over those fees in November. That said, for Americans and Australians, at least, the fee is valid for ten years; for Canadians it only earns a single entry. This coming week, I will wind up my tour promoting Moon Handbooks Argentina with two events in Chicago: Tuesday evening with a dinner meeting at the Adventurers Club, under the auspices of the Geographic Society of Chicago, and Wednesday afternoon at the Chicago Cultural Center, also with the sponsorship of the Geographic Society. 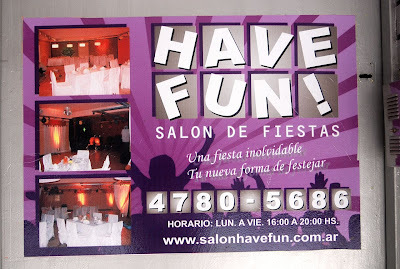 In the course of my current book tour, promoting the new edition of Moon Handbooks Argentina, one of the most frequently asked questions is whether Argentines speak English. This is also a common question regarding Chile, my other principal destination, and the answer is not a simple yes or no. Verbal communication is a recurring theme in international travel everywhere, and one of the best analyses I’ve ever heard came from a speaker whose name, unfortunately, I cannot recall. At a conference in Melbourne, Australia, sponsored by a guidebook publisher whose name I will avoid mentioning, he said that it was the wrong question, encouraged by a misguided mind-set - the notion that foreigners should speak your language, rather than that you should speak theirs. His goal, though, was not to castigate listeners for their lack of foreign language skills, but rather to encourage them to interact with, and learn from, non-English speakers. His starting point was his conviction that native English speakers undervalue their own communications skills despite their fluency in a language with one of world’s richest vocabularies, which has absorbed many of its words from other languages - mostly but far from exclusively European in origin. In that sense, he argued, if you know even a single word of, say, Chinese - you speak Chinese. It’s true you may not speak very much, but you have a base to build on. While his argument may be hyperbole, it has the positive advantage of stressing the fact, even if the glass isn’t quite half full, there’s at least a drop in it and, if you make an effort, it’ll fill over time. 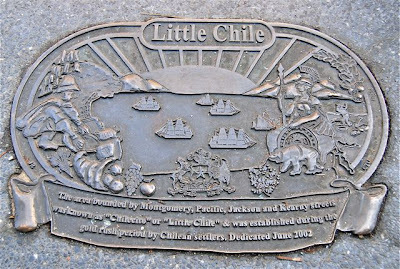 When I first traveled to Chile, in 1979, foreign visitors were few, largely because of the notorious Augusto Pinochet dictatorship; Argentina’s military regime, the so-called Proceso, was arguably even worse. At the time, my Spanish was rudimentary but, because there were so few English speakers, I found myself immersed in a Spanish-speaking environment that improved my skills by leaps and bounds. 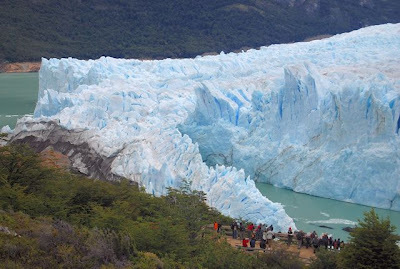 Though the mental exertion often left me exhausted at day’s end, it was also rewarding and helped me gain insights into what was happening there (and in Argentine Patagonia, which I visited on the same trip). Three decades later, though, the situation has changed. No longer international pariahs, Argentina and Chile have vigorous travel and tourism sectors, and English is widely spoken in national, provincial and municipal tourism offices, among private tour operators, and in accommodations ranging from hostels to five-star hotels. Especially in top restaurants, waiters have learned to speak English (which, undoubtedly, increases their tips). Argentina, of course, has long had a significant Anglo-Argentine population, and the English-language daily Buenos Aires Herald has published continuously since 1876. 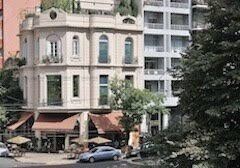 Many other Argentines, especially in Buenos Aires, also speak good English, but as I noted in an earlier post, many English words and phrases have also been absorbed into local speech. While Chile may be less bilingual than Argentina, the ambitious “English Open Doors” program is an attempt to ensure that every schoolchild has an opportunity to learn the language of international commerce. Even if it falls short, for a lack of qualified instructors and other reasons, things can only improve. All that said, that doesn’t mean visitors to Argentina and Chile need to seek out English speakers for everything. As my Melbourne lecturer might say, English speakers already have a great deal of cognate vocabulary and Americans in particular are beneficiaries of many words - such as amigo, gracias and pronto - that English has effectively adopted from the original Spanish. Still, don’t expect to find English-speaking auto mechanics, bus drivers, butchers, or other blue-collar occupations. Tonight I will be discussing Argentina in a digital slide lecture at the Travel Bug Bookstore in Vancouver BC at 7 p.m.. 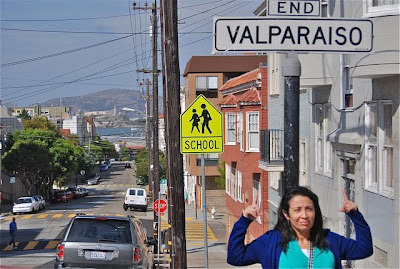 Tomorrow night, I'l be back in Seattle, Washington, at Wide World Books, also at 7 p.m.
Until today, I have refrained from writing anything about the miners rescued yesterday from Mina San José, on the outskirts of the northern Chilean city of Copiapó. That’s partly because the 24/7 international coverage of their plight and rescue has been so overwhelming but, on the other hand, much of that coverage hasn’t told us much about the region. 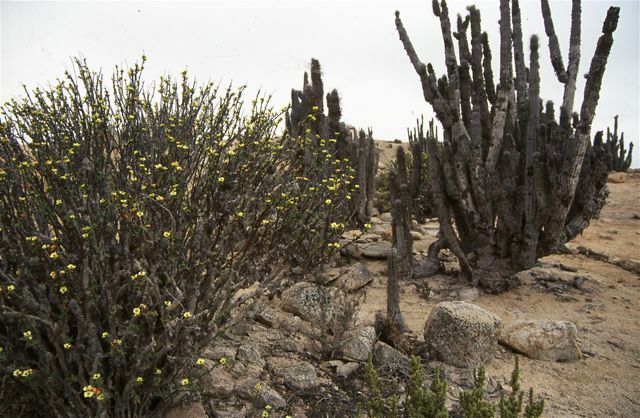 In fact, the “Norte Chico” (Lesser North), as the southern sector of the Atacama Desert is known, may be the least appreciated part of the entire country - in fact, it probably gets fewer foreign visitors than any other region. 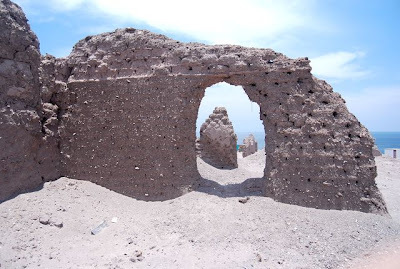 In reality, it probably gets fewer than the popular “Norte Grande” (Greater North) village of San Pedro de Atacama alone. That’s because the traditional description of “the Land of 10,000 Mines” - probably a quantitative understatement - isn’t exactly a slogan that pulls in tourists. Nevertheless, it’s had its share of celebrity visitors, including Charles Darwin who, in the 1830s, remarked that “its produce is sufficient for only three months of the year,’ and that transportation problems raised the price of food to astonishing levels. To some degree, that’s still true, and one reason - along with risk of injury or death - why wages are often higher here than elsewhere in Chile. 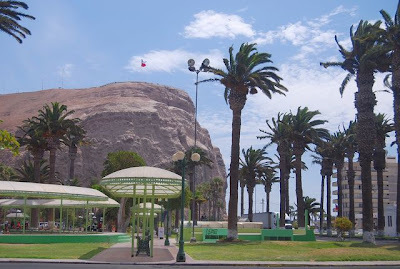 Copiapó is the capital of the Third Region of Atacama, which comprises the northern half of the Norte Chico (the Fourth Region of Coquimbo, capital La Serena, gets many more visitors for its broad sandy beaches and greater proximity to Santiago). Its most appealing sight, in my opinion, is Parque Nacional Pan de Azúcar (pictured above), a seaside reserve near the mining port of Chañaral, which has abundant sandy beaches at the base of barren headlands, backed by impressive coastal mountains, but also surprisingly lush vegetations in areas where coastal fog condenses on their western slopes. 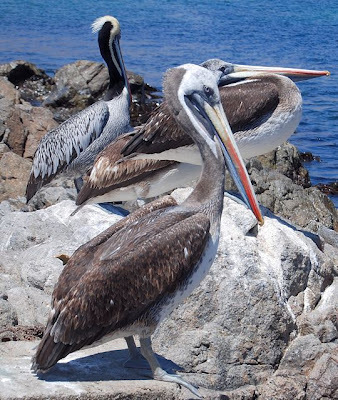 It also features abundant bird life, including Humboldt penguins and brown pelicans. Still, it’s the mines that have put the region on the global map, and it’s worth noting that Chile’s mines are divided between a large-scale sector with ample capital, partly but not exclusively state-run through the Codelco corporation, and a smaller sector that often cuts corners - as was the case with Mina San José. Still, it’s also a sector that pays higher wages to compensate for the dangers that working there involves. In an excellent GQ magazine article, Sean Flynn details those dangers, as well as the media frenzy that has surrounded the miners’ drama. While there may be some quarrels with the media management of the miners’ story by the Chilean government - limiting direct access to the state-run TV Nacional and official photographers, for instance - at the end of the day, with the whole world watching, the Chileans did everything right. That’s whether or not, when the clamor dies down, the ephemeral “Campo Esperanza” (Camp Hope), which housed the miners’ families and friends just outside the mine, becomes a tourist attraction in its own right. 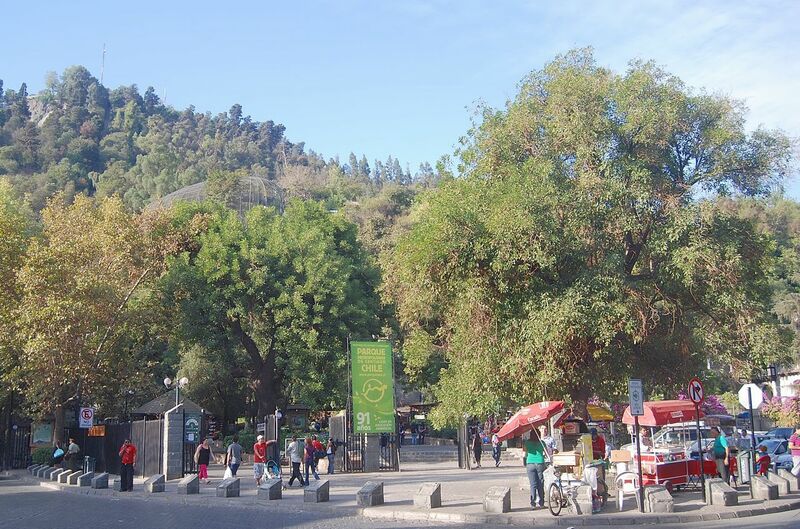 According to the online Santiago Times, it's under consideration as a national monument. This is a busy for digital slide presentations on the new edition of Moon Handbooks Argentina, with four events in five days. The fun starts Saturday afternoon October 16 at 5 p.m. at Travel Bug Books in Santa Fe, New Mexico, and continues Monday evening October 18 at 7 p.m. at Village Books in Bellingham, Washington. We then cross the border to Travel Bug Books (no relation) in Vancouver BC, Tuesday evening October 19 at 7 p.m., and return to Seattle, Washington for an event at Wide World Books, Wednesday October 20 at 7 p.m. Compared to most North American cities, the Southern Cone capitals of Buenos Aires and Santiago de Chile have superior public transportation, at moderate cost, but it’s a challenge for them to keep up with burgeoning populations in sprawling metropolitan areas. The fastest away to get around either city is by subway (underground), but the two systems are a study in contrasts. 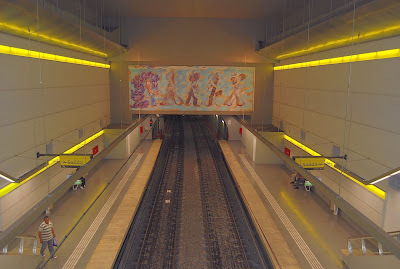 Buenos Aires has the continent’s oldest subway, dating from 1913, but the Subte now lags behind the Metro de Santiago (pictured above, the impeccable Chilean system opened in 1975) and is trying to catch up. According to the Porteño daily Clarín, the private concessionaire Metrovías now operates a network of only 47 kilometers on six lines - less than half the 100 kilometers of track of the Chilean capital’s five lines. 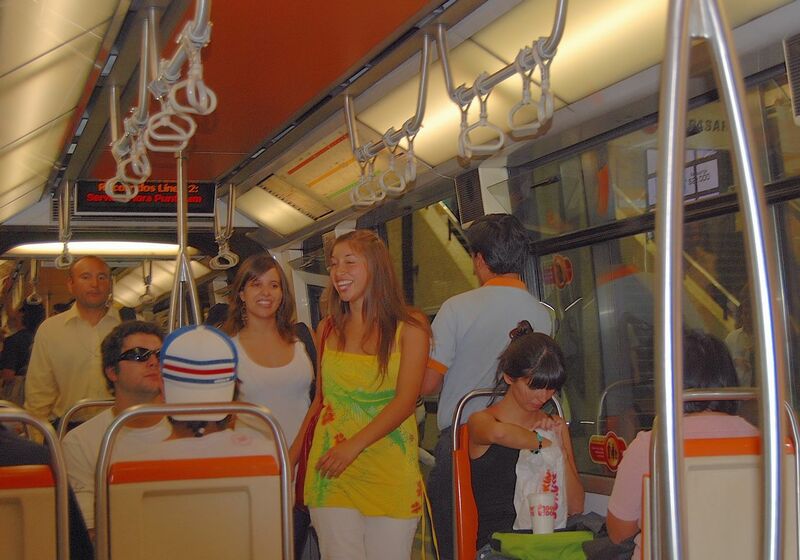 Despite its pioneering history, the Buenos Aires underground now ranks only fifth in the region, well behind Mexico City, São Paulo and Rio de Janeiro in addition to Santiago. In fairness, sprawling Gran Santiago (Greater Santiago) covers a substantially larger area (about 640 square kilometers or 248 square miles) than the federal district of Buenos Aires (192 square kilometers or 74 square miles, only a little bigger than San Francisco). The Santiago system serves twice as many people as the Subte, which does not venture beyond the city limits of Buenos Aires, which has only about three million residents (another ten million-plus live in the surrounding counties of Buenos Aires province, however). 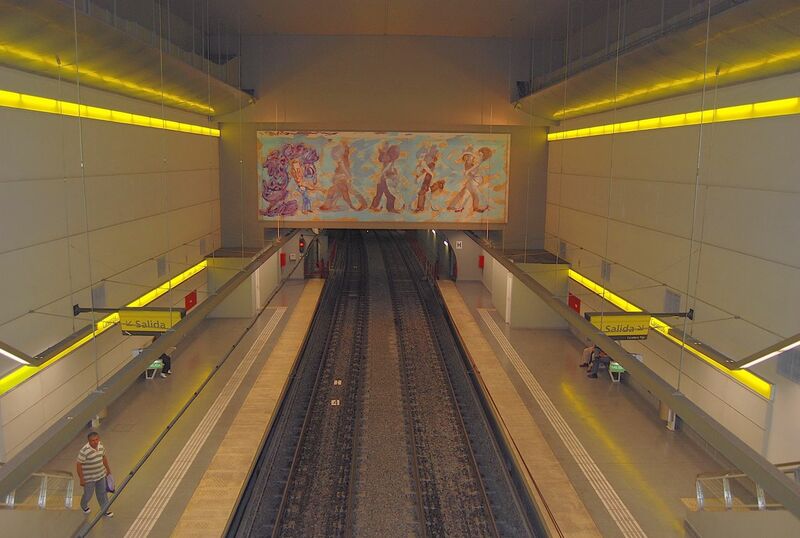 Still, there is reason to be disappointed with the slow expansion of the Subte, despite gleaming new stations such as Estación Caseros (pictured above), on the crosstown Línea H (which is soon to open a new transfer station at Corrientes, connecting with Línea B’s Estación Pueyrredón). When the administration of current mayor Mauricio Macri took office in 2007, he promised the system would expand by ten kilometers per year - a figure since adjusted downward to two or three kilometers per annum. At the rate, it will take at least 18 years to catch up with the Chileans - presuming the Santiago system fails to expand any further. Taxi fares are rising, once again, in Buenos Aires. According to Clarín, by next weekend rates will rise by 26 percent - the increased cost to bajar la bandera (drop the flag) on boarding will go from 4.60 pesos (about US$1.20) to 5.80 pesos (almost US$1.50), while the charge per 100 meters will climb from 46 centavos (12 US cents) to 58 centavos (15 US cents). 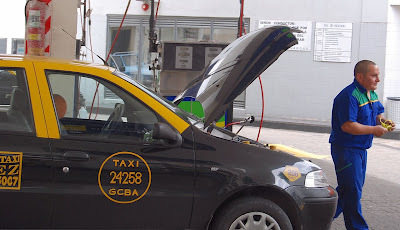 Since 2003, when the cost of the ficha was 14 centavos, taxi fares in the city have risen by 314 percent. The city’s 30,000 or so cabs will benefit, even if costs locals and visitors more to get around. Actually, on the avenue would be closer to the truth. Wednesday night at 7 p.m., I will deliver a digital slide presentation on Argentina at REI Berkeley, only a few miles from my home in Oakland. Admission is free of charge and walkups are welcome, but it’s best to reserve a seat via the REI website. In my own writings, I have tried to deal candidly with the topic of personal security in the Southern Cone countries, and have concluded that Argentina, Chile, and Uruguay are at least as safe as Europe for foreign visitors. Still, it can be a hard sell in a region with a stereotypical reputation for drug violence (as in Colombia and Mexico), erratic authoritarian leaders (as in Venezuela), and a legacy of brutal military dictatorships (as in 1970s Argentina, Brazil, Chile and Uruguay). Latin America is diverse, though, and in today’s Southern Cone, political violence is almost unheard of, even if intemperate language between (and even within) opposing political factions is often the rule rather than the exception. It doesn’t help, though, when locals themselves, spurred by sensationalist coverage of gruesome but atypical crimes, exaggerate the issue of “insecurity” even if, statistically speaking, their chances of being a victim are miniscule. Every city and country, of course, have bad neighborhoods, such as Buenos Aires’s so-called Fuerte Apache (actually just outside the city limits). Still, foreign visitors are unlikely to even see those neighborhoods except at a distance - they’ll be visiting tourist-friendly barrios such as Palermo, Recoleta and San Telmo instead. In remote areas such as Patagonia, serious crime is nearly non-existent. As Steves implies, though, Southern Cone inhabitants might have more to worry about in visiting the United States. If 35-year-old Adolfo Ignacio Celedón of Santiago (his hometown's placid Parque Metropolitano is pictured above) had not traveled to this country, he would not have been shot to death by yet unknown assailants last September 18th in Berkeley, California - only a couple miles from my own home in Oakland - in the presence of his American fiancée. 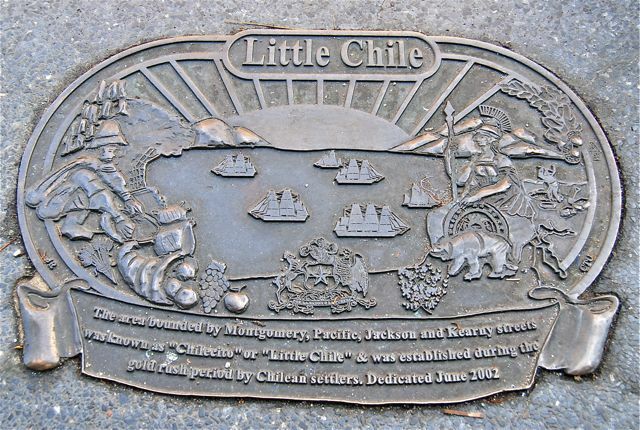 In the aftermath, San Francisco Chronicle reporter Henry K. Lee found himself inundated with requests from the Chilean media for information about the senseless killing, and the story made the front page in the Santiago daily La Nación. One commentator on the article recalled another instance in which a “hateful racist” killed two vacationing Chileans and wounded three others in Florida in 2009. Another reader, charitably enough, countered that “assaults, robberies and other crimes take place everywhere, in every country.” Still, this provides some perspective on the often mistaken notion that staying home is safer than traveling. After a brief respite, I will have two digital slide presentations on Moon Handbooks Argentina this weekend. The first will take place Saturday evening October 9th in Sacramento, California, at Tango by the River, at 7 p.m. The second takes place Sunday afternoon October 10th at the legendary Book Passage in Corte Madera, California, at 1 p.m.
Nobody will ever duplicate the photograph below, of Ross Road in the Falkland Islands’ capital of Stanley, because the vantage point from which it was taken no longer exists - well, it does still exist, but it’s now in Buenos Aires. That, of course, requires some explanation. In 1986-7, when I spent a year-plus as a Fulbright-Hays scholar in the Islands, there were still many reminders of the 74-day war that began in April 1982, when Argentina’s tottering military dictatorship bought themselves a few extra months in power by invading and occupying the remote South Atlantic archipelago, which Argentines know as the Malvinas. I have no desire to go into the rights and wrongs of British colonialism and Argentine irredentism here, but only to point out that the war left a palpable impact on the islands - many of the minefields planted to deter the British counter-invasion, for instance, still remain on the beaches at Gypsy Cove (near Stanley) and other locations. Other impacts, though, were more transitory, and one of those was the 494-ton oil tender known as the Yehuin, which was left in Stanley Harbour after Argentine forces surrendered. Viewed as military surplus, the homely “Black Pig” (so called for its paint job) briefly belonged to an English friend of mine who often puttered around the water to the consternation of the local harbormaster, who considered that the vessel was not seaworthy and that my friend - a talented jack-of-all-trades - was not qualified to sail it. In my last months in Stanley, the Black Pig was docked at the Falkland Islands Company jetty at the east end of Ross Road and, one fine clear day, I walked aboard the ship and climbed the mast to take the photograph above, which looks west. 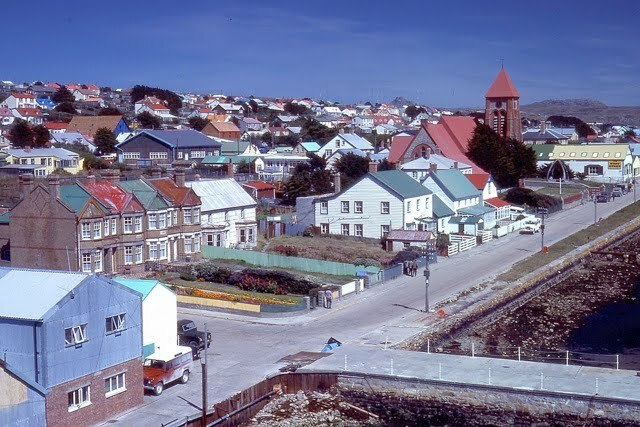 As Stanley is a town of low-slung houses, this was the only place in town to gain an aerial perspective on its main commercial street, which looks very different nearly a quarter century later. At some point, though, the ex-Yehuin was again sold off to Spain’s Cintra company and, now Panama-flagged as the Audax II, it showed up in Buenos Aires’s Dársena Sur port area a couple weeks ago. There, a ragtag “Resistencia Patriótica” (Patriotic Resistance) symbolically reclaimed the ship by tagging it with spray paint Peronist scribbles - an event which they commemorated with a Youtube video (see below) that borders on self-parody - raising an Argentine flag, for instance, on the same mast I climbed for my photograph. Of course, acknowledging international maritime tradition, the ship was already flying an Argentine flag. Apparently, in fact, there was a 1999 decree to declare the Yehuin part of the country’s naval heritage, but no congressional action ever implemented the measure. The Resistencia Patriótica, meanwhile, has asked a federal judge to impound it but, for my part, I’m simply pleased the Black Pig was there when I needed it.